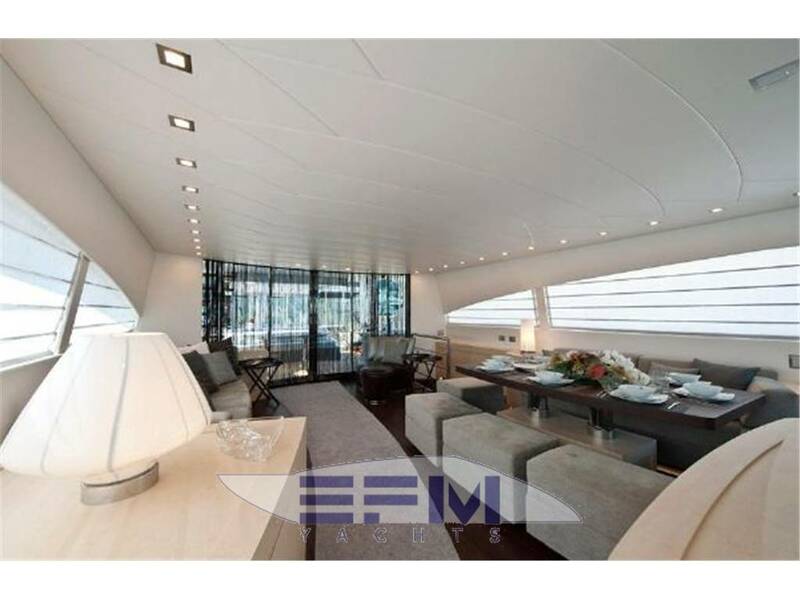 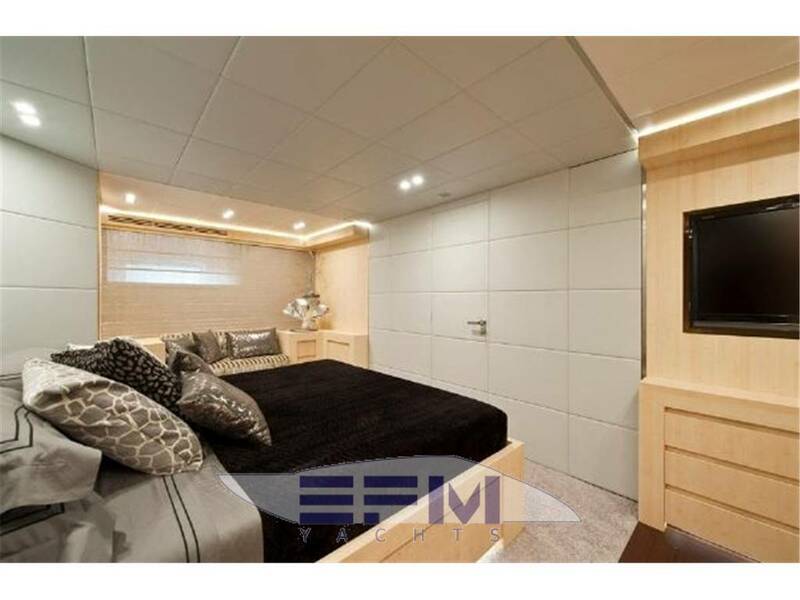 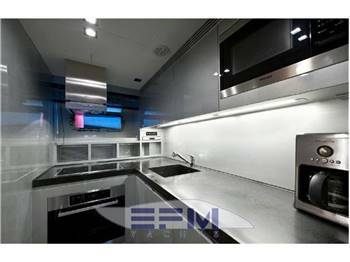 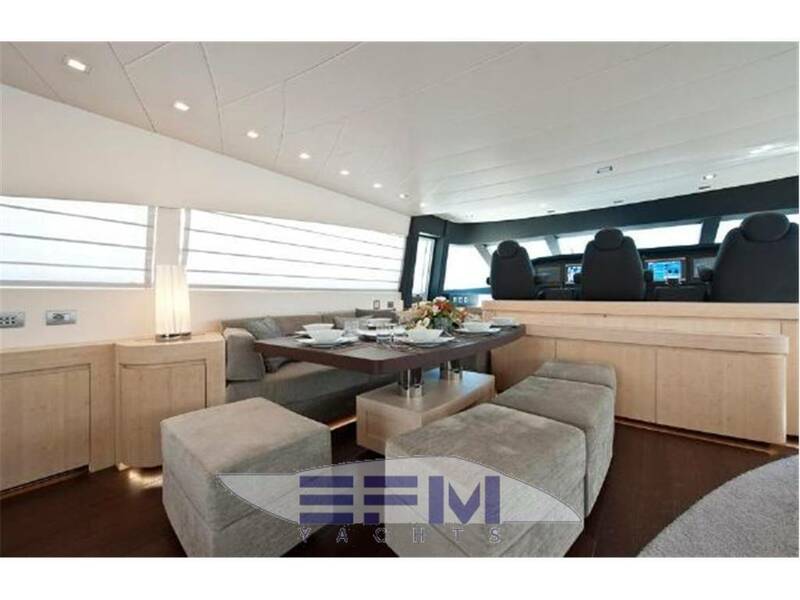 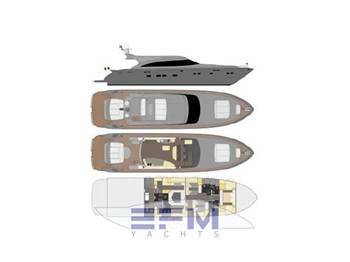 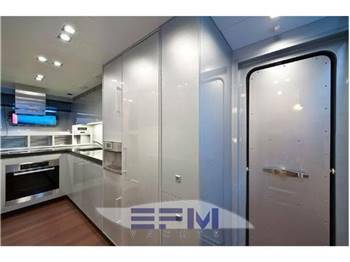 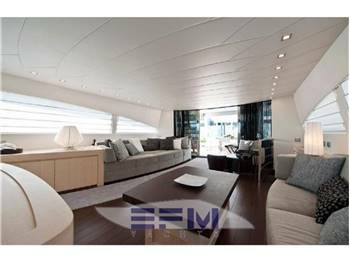 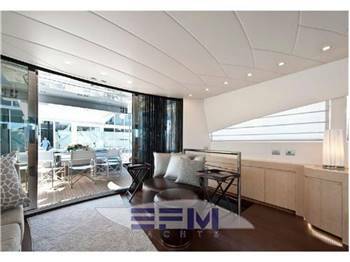 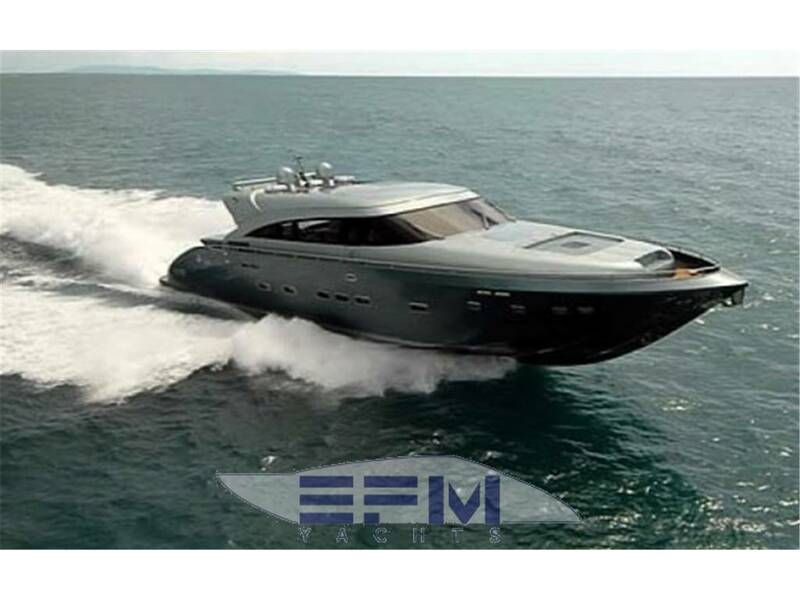 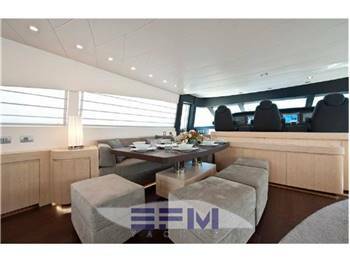 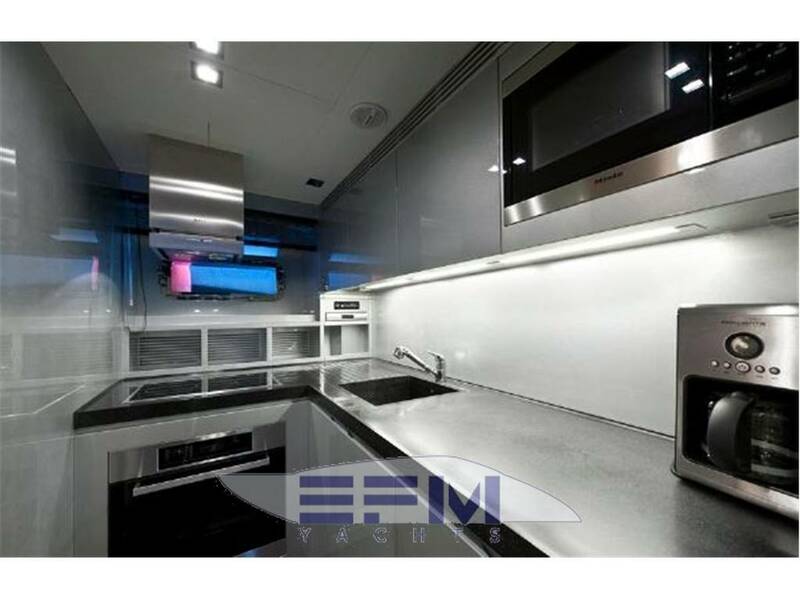 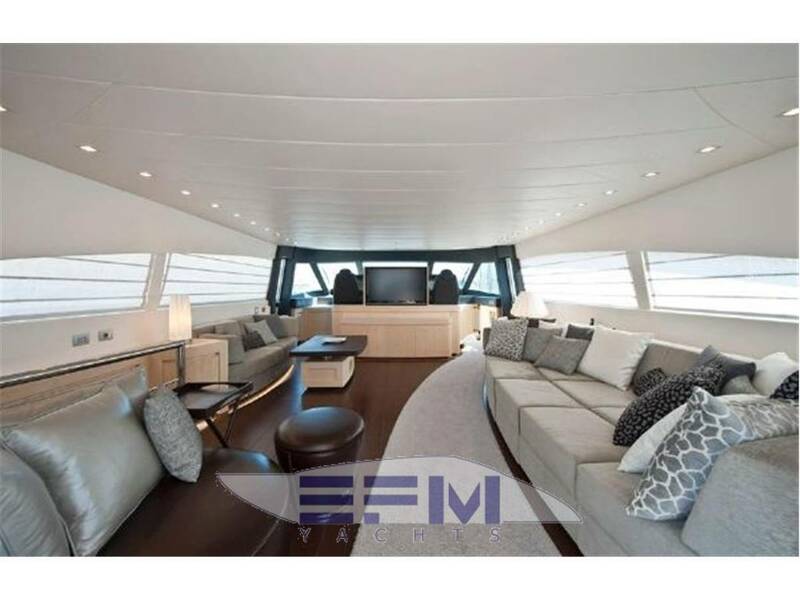 Imbarcazione inserita il 18/09/2018 da EFM YACHTS - Imbarcazione visitata 1124 volte. 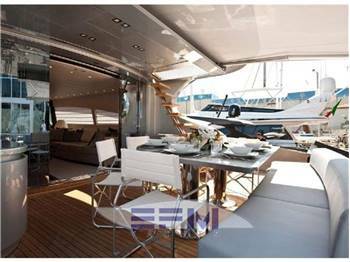 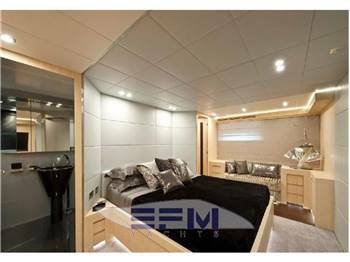 AB 92’ REVEIL is a very comfortable motor yacht with her huge salon, four cabins (10 guests in total) with ensuite bathrooms and a clever crew area at the stern to offer the best service to the guests. 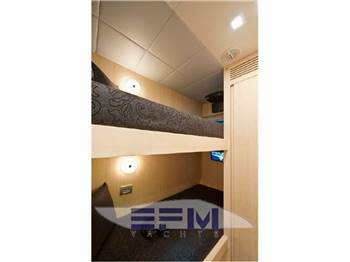 REVEIL offers three different area to chill out: cockpit, sun beds at the front and sun deck on top of the hard top. 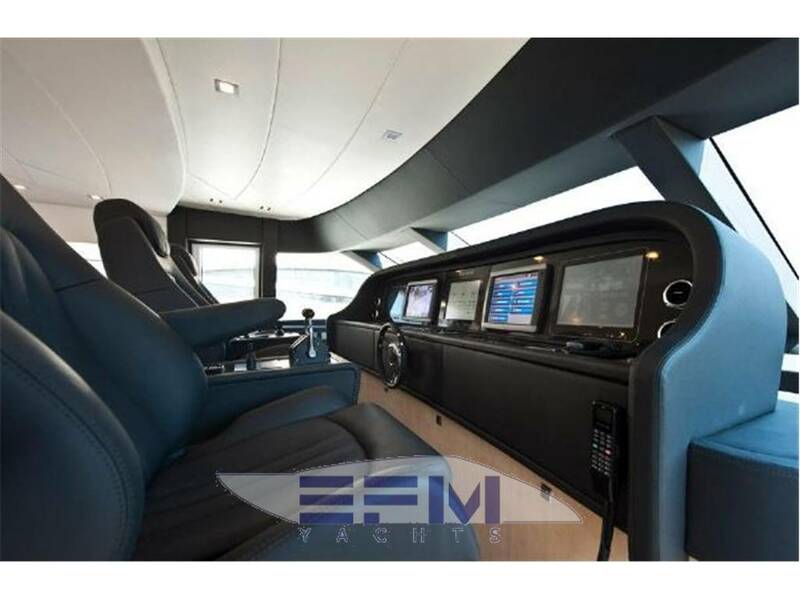 This very sporty design boat is only private used. In addition of her amazing performances by 3 X 1.850 Hp Caterpillar engines with 3 X MJP waterjet propulsion this 92’ feet motor yacht is able to reach more than 50k. An important service was done on the water jets in 2015 and the paint was refreshed in 2016. 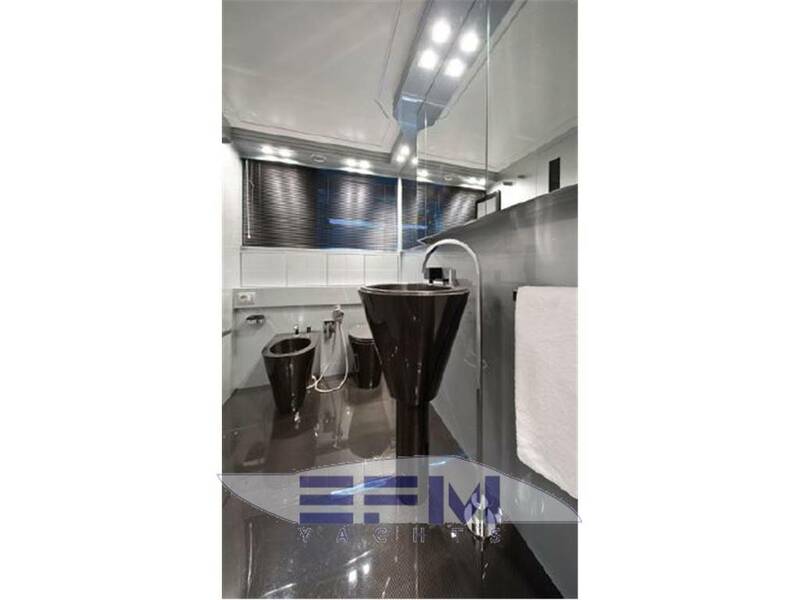 Verniciatura completa scafo e zona prodiera della coperta con antiscivolo - Sostituzione Generatore Stb con uno maggiorato a 27 Kw invece di 22 Kw - Sostituzione completa raiser su tre motori - Manutenzione straordinaria jet MJP con sostituzione di tutti i flessibili, revisione completa di 5 pistoni e sostituzione di 3 - Revisione completa e sostituzione ove necessario di TUTTE le pompe Gianneschi compreso antincendio - Manutenzione straordinaria con smontaggio completo di tutte le prese mare, tubazioni interne con sabbiatura, primer e verniciatura epossidica - Sostituzione di tutte le valvole distribuzione acqua in sala macchine - Sostituzione batterie motori (07/2015), servizi e generatori - Sistemazione completa impianto elettrico, nuove luci RGB - Revisione centraline idrauliche con sostituzione motori, olio e filtri. 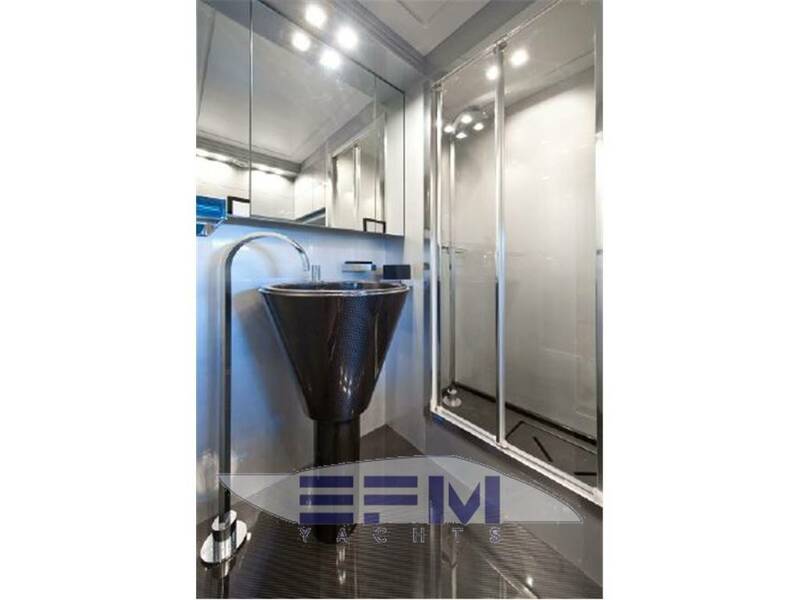 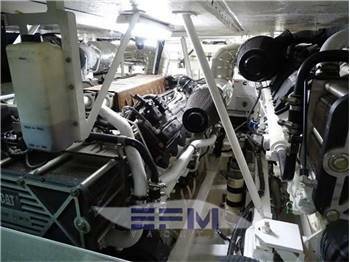 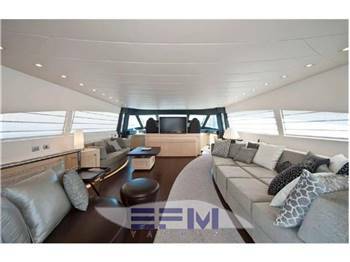 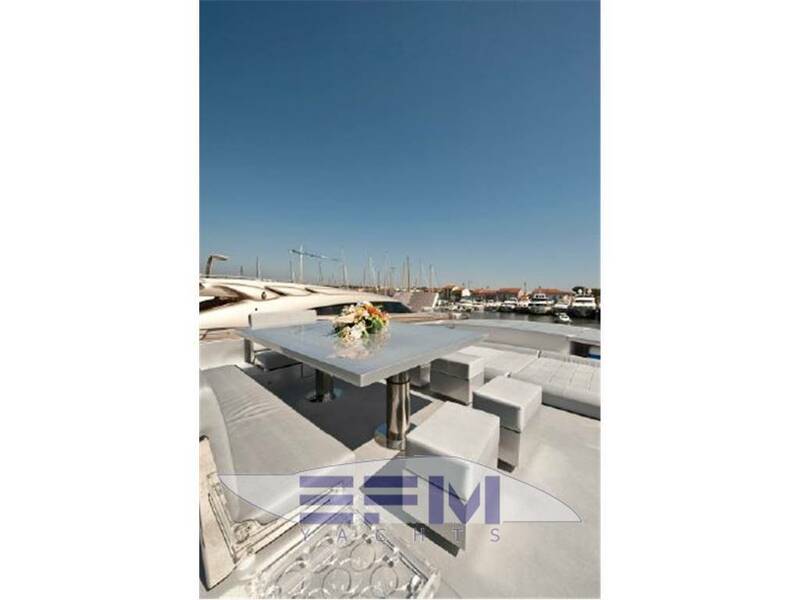 - Revisione pistoni idraulici portone garage - Sostituzione tubi idraulici per bow thruster e pompa idraulica jet - Verifica e sostituzione giunti tra albero motore e asse turbina con relativo allineamento - Rifacimento in aramat/kevlar flange uscita asse turbina - Rifacimento tutti giunti su ponte teak e relativa levigatura - Tavolo pozzetto riverniciato - Tavolo salone riverniciato - Nuova copertura antipioggia per Fly - Anodi completi - Antivegetativa International VC Offshore - Sostituzione verricello per jet sky - Pulizia profonda cuscineria divani Vari lavori di manutenzione generale: Boiler, Battery Charger, Doccia Pozzetto, faro notturno e minuteria varia. Complete painting of the hull and the forward area of ​​the deck with anti-slip - Replacement Stb Generator with one increased to 27 Kw instead of 22 Kw - Complete replacement raiser on three engines - Extraordinary maintenance MJP jet with replacement of all hoses, overhaul of 5 pistons and replacement of 3 - Complete overhaul and replacement, if necessary, of ALL Giannini's pumps including fire-fighting - Extraordinary maintenance with complete disassembly of all sea outlets, internal piping with sandblasting, primer and epoxy painting - Replacing all the water distribution valves in the engine room - Replacement motor batteries (07/2015), services and generators - Complete electrical system arrangement, new RGB lights - Revision of hydraulic power units with engines, oil and filters replacement. 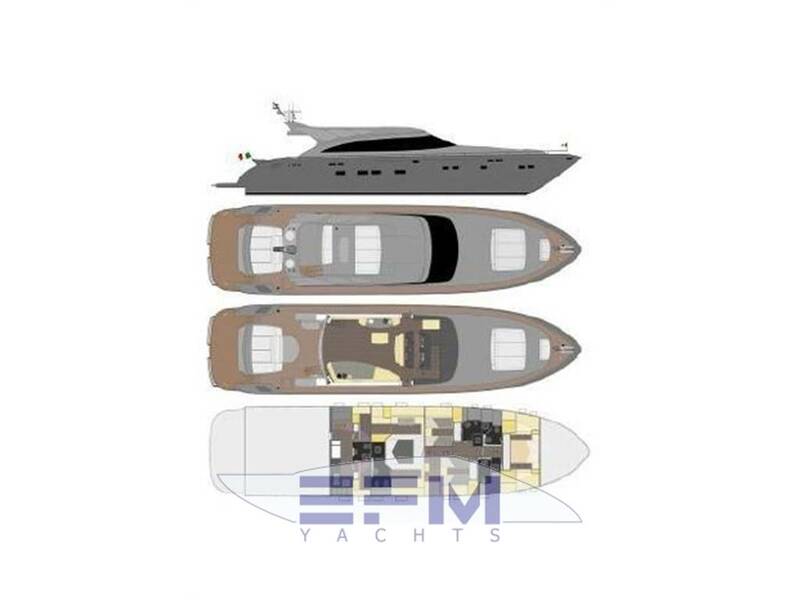 - Revision hydraulic pistons garage door - Replacing hydraulic pipes for bow thruster and hydraulic jet pump - Checking and replacing joints between crankshaft and turbine axle with relative alignment - Aramat / kevlar make-up flanges turbine axle output - Rebuilding all joints on teak deck and relative sanding - Repoiced cockpit table - Repainted saloon table - New rainproof cover for Fly - Complete anodes - International VC Antifouling Antifouling - Replacement winch for jet sky - Deep cleaning sofa cushions Various general maintenance: Boiler, Battery Charger, Cockpit shower, night light and various small parts.